Another day at sea as the ship returns across the Aegean from Turkey back to Croatia. 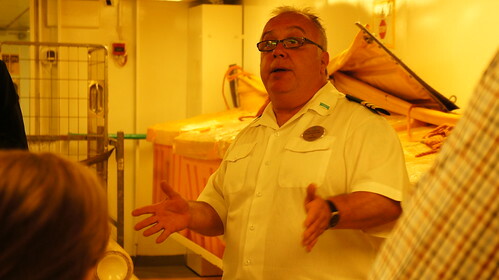 Highlight of the day is a Behind-the-Scenes ship tour with officers and crew of Norwegian Jade. 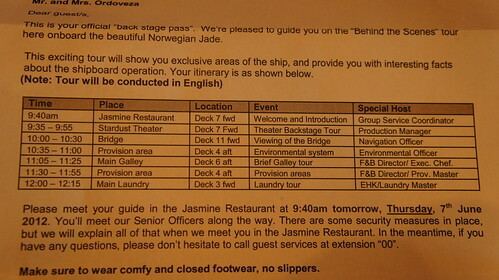 The tour doesn’t come free, though: it costs $55 per person in onboard credit, kind of a shipboard excursion. 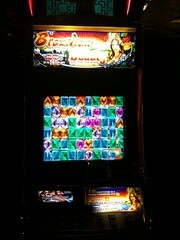 A fair-sized group of about 15 passengers meets in the ship’s Asian restaurant, Jasmine. 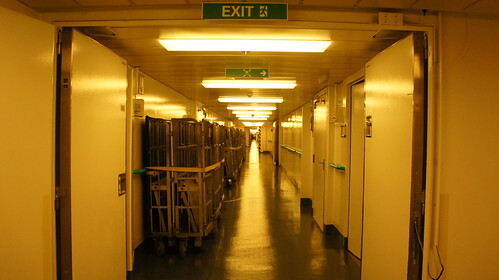 From there we go through the Stardust Theater and backstage into crew-only zones, where cast and stage support logistics share space with maritime hardware amidst mazelike gangways and access hatches. 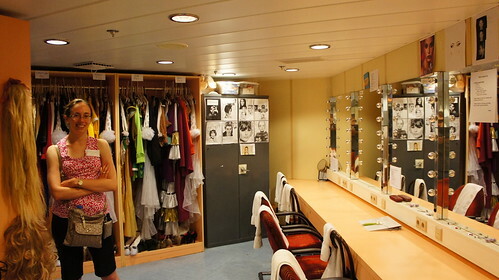 The dressing room is at the frontmost point on the ship. The stage manager, a Japanese-American pro from the New York Broadway scene, is also a bit of an evangelist for theater, on board and in general, seeking to stoke and revive interest in the performing arts amongst the general public. 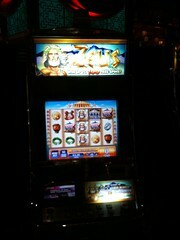 Next stop: the bridge. Up front on deck 11, the ship’s control center stretches across the beam of the ship (and then some, with scenic bump-outs protruding on either side), consoles and stations for various onboard operations facing angled floor-to-ceiling windows. 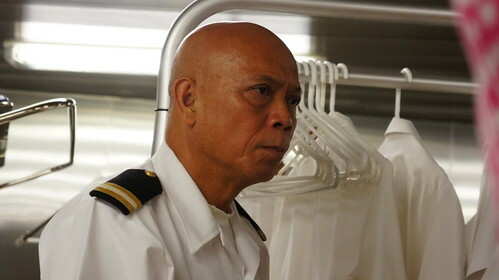 A pair of officers work at the U-shaped navigation station at forward center, with the ship’s First Officer in command. All around is the bright blue Aegean Sea, and underfoot, a soft dark blue carpet. Behind navigation, a manual steering station. On a table at the aft end of the bridge, a snack platter of meats and cheeses. 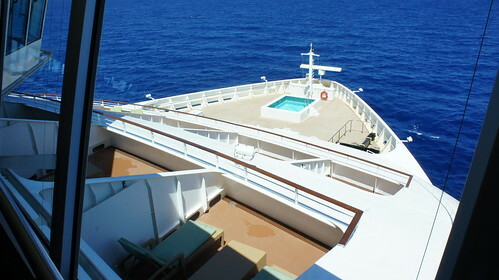 Farther forward, down the slope of balcony cabins, a crew-only pool sits on the forward deck. 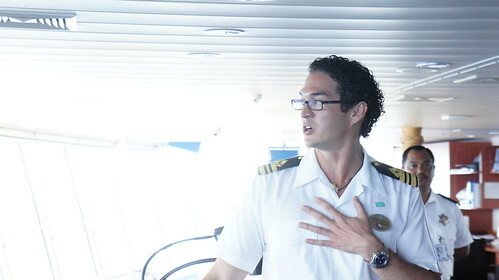 The First Officer is a young Panamanian with a passion for the maritime profession, able to converse at length on just about anything to do with ships, navigation, and engineering. 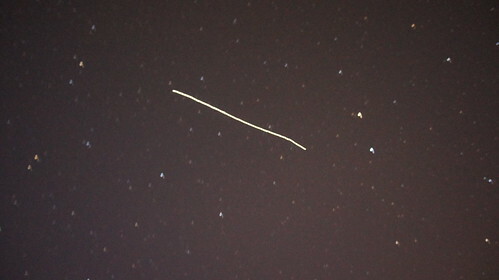 He also knows a thing or two about astronomy and we briefly compare notes on photographing the transit of Venus and ISS flyovers (one of which I was able to catch the night before). 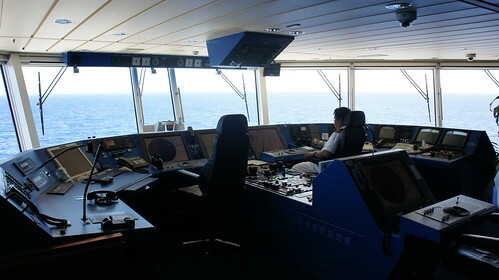 Just aft of the bridge is an observation room, open to all, from where passengers can watch bridge operations without disturbing the crew. 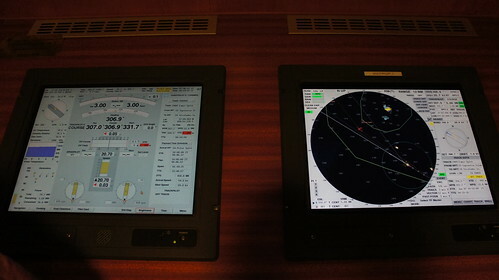 Monitors here mirror electronic navigation charts and radar display. 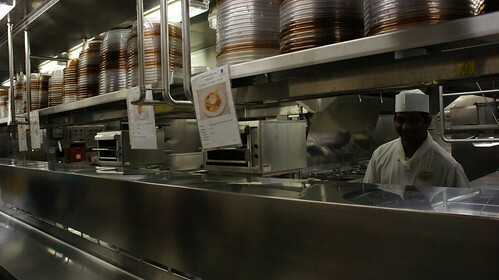 From the bridge we go down to the kitchen, which sits between the two main dining rooms on Deck 6. 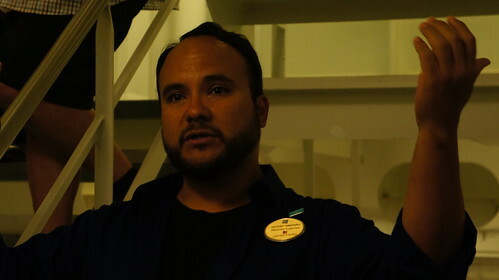 As the executive chef talks about onboard food preparation, I note the menu schedule for the rest of the cruise pinned to one wall. Lots of Filipino cooks around the kitchen. 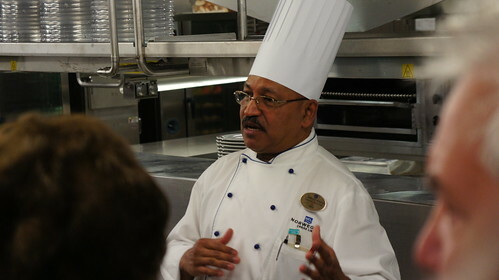 Kitchen is where the food is cooked, but the ingredients pass through Provisions first. 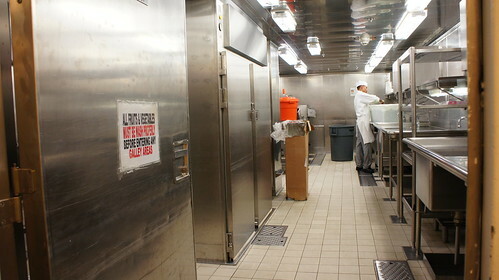 We descend belowdecks to see the complex of receiving docks, storage lockers, chopping blocks, and washing sinks where food is stocked and prepared before going up to the kitchen. I talk a bit with the Provisions Chief, yet another Filipino. We also walk through the Environmental Section, handling cooling, heating, water, and waste management. No photos allowed but I get a picture of the environmental chief before walking through a refrigerated recycle compactor-cube locker and a waste water processing facility. 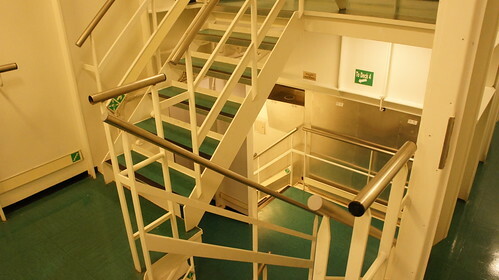 We also pass through the so-called “I-95” corridor on Deck 4 which stretches almost the full length of the ship for easy crew access to all sections. Last stop on the tour is the Laundry area, where we see an amazing array of washers, dryers, steamers, and a heavy-duty assembly line of blanket-and-towel folding machines. 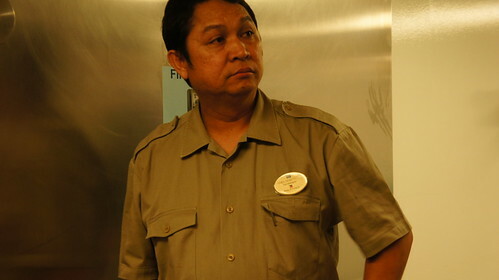 Again, no photos allowed, but I manage to sneak a few portrait shots of the laundry chief — again, a Filipino who’s been in the business for a while. So ends the behind-the-scenes ship tour — very educational and well worth the time and money to do at least once. After the tour we go up to the pool deck to try and get some sun but it’s too windy and crowded. 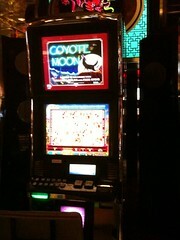 Instead we wander around the casino for a bit to survey amusingly themed slot machines. 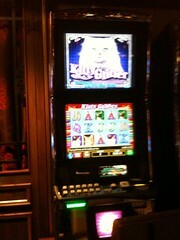 We didn’t play slots or blackjack or do any gambling, though. 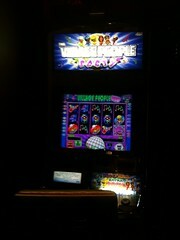 Not our thing. 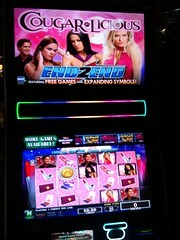 Full cruise ship photoset here.